Before the Internet also reached the banking sector, there was only one way to make a money transfer to clients: remittance slip. They were and are still remittance slips at all banks counters, sometimes they are also sent by post along with the invoice. So if you get a preprinted transaction form do not be surprised. Earlier, you the forms contained Bank Account Number and Bank Code, however with the new SEPA transfer, it contains IBAN number and BIC Code. You can see the SEPA Remittance or Transfer Slip below, with translation of the terms in English. 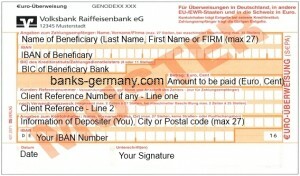 BIC Code of the beneficary bank – Earlier forms had the Bank Sort Code (Bankleitzahl) or BLZ of beneficiary (8 digits). Reference number of account (Kunden Referenznummer) – This is 2 lines of multipurpose field to tell the beneficiary what the payment is for (e.g. invoice number / Client Reference number). Fill up the application form and give it to the teller at the counter. The teller would then check your account for sufficient funds and then perform transfer. It might take a day or 2 transferred to take effect. Online money transfers work on the same principle. The input forms of online banking portals largely the same input requirement as the classical transfer forms. The differences is that most systems automatically add the Bank details according to the beneficiary’s bank sort code. The payment will be released with a transaction number. More details about different types of online transfer will be explained in separate headings. I am restricted to send money outside Germany, is it possible to make local bank transfers to other bank within Germany from my account.